The latest rage Instant Pot has reached my kitchen and I’ve started cooking in it and I’m absolutely blown away by it. Instant Pot is a multi-use programmable pressure cooker. Literally, anything can be cooked in it. It acts as a rice cooker, pressure cooker, slow cooker, steamer and yogurt maker. The best part is that you can also saute in this and then pressure cook the ingredients. It has a few keys on the control panel, might feel overwhelming in the beginning. 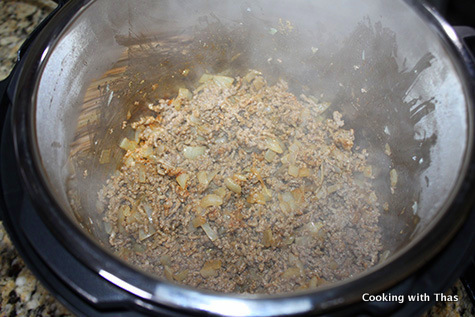 Once you start playing with the different keys and familiarize with it, cooking in the Instant Pot will be a breeze. 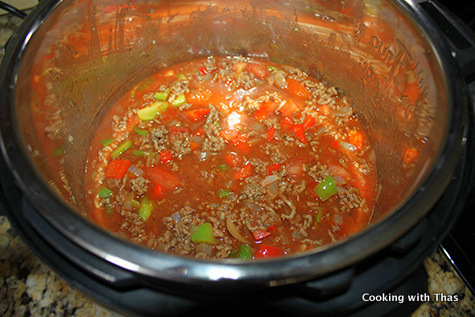 I made ground beef stew or more like a Chili in the instant pot, my first ever instant pot cooked dish. First, I sautéed onion and ground beef and then pressure cooked at high for 15 minutes, the ground beef turned out very tender and the stew tasted delicious. 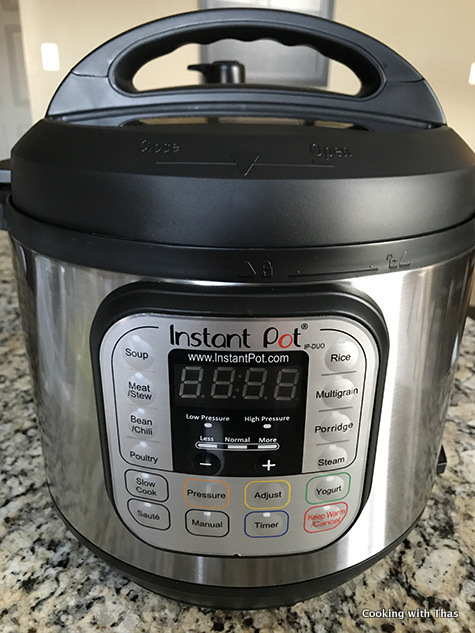 I’ll be posting a video review of the Instant pot soon and more easy recipes are on its way, stay tuned! 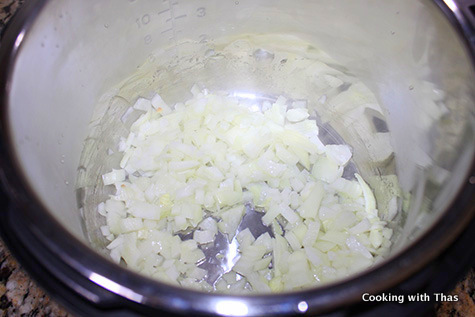 Place the stainless steel pot into the main pot. Press the Saute key on the control panel. Click the Adjust key and you can choose less, normal or more- heat setting. I selected the normal, it will start to heat up and you will see ON sign on the LED display. After the pot has turned hot, you will see the HOT sign on the display. 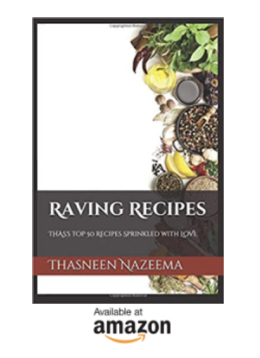 Now, you can start sautéing. Important: While sautéing do not close the pot with the instant pot lid. Add 1 tbsp oil, let it turn hot. Add onion, season with salt and saute for a few minutes till light golden. 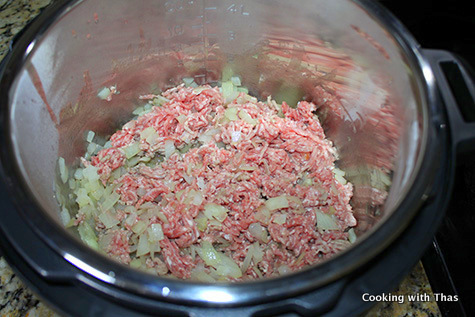 Add ground beef, break the ground beef using an wooden spoon to avoid formation of lumps. Saute for a few minutes till the pink color has faded. Add garlic powder, chili powder, cumin powder, coriander powder, dried oregano and salt. Combine well. 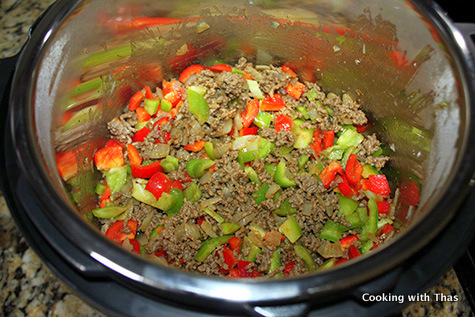 Add green pepper, red pepper and chopped tomato. Combine well. Add tomato sauce, soy sauce and water, combine well. Click on the Cancel key to cancel the saute mode. Make sure the pressure release valve on the lid is in the sealing position. Click on Manualkey first and then click on Pressure, select high pressure. (there are 2 options: low and high pressure). Click the + button and set the time to 15 minutes and walk away. After 15 minutes of pressure cooking, it will beep. You can either have the steam release naturally, it will take around 20 minutes. Or after 10 minutes, turn the pressure release valve on the lid to venting and you can see the steam releasing. Be careful as the steam is very hot. After the pressure has released completely, open the lid. 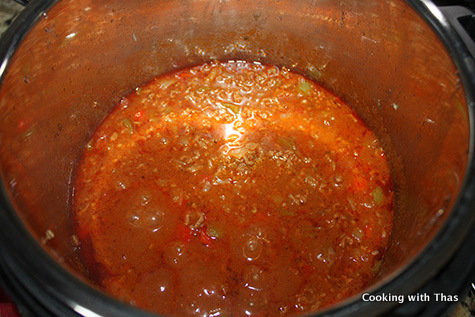 If the stew is watery, you can cook for a few more minutes by turning on the saute key. Saute, Adjust to normal and let cook for a few more minutes. Add cilantro and corn if adding at this point, combine well and let cook for a few minutes. 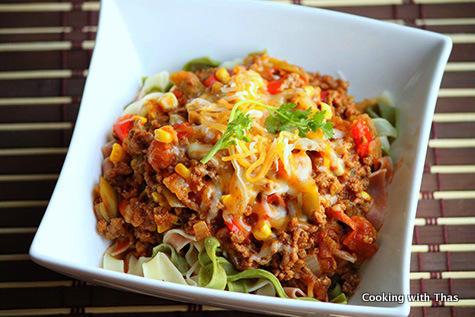 I served this with pasta, add pasta into a bowl, top with ground beef stew and add cheddar cheese on top and serve. Enjoy! 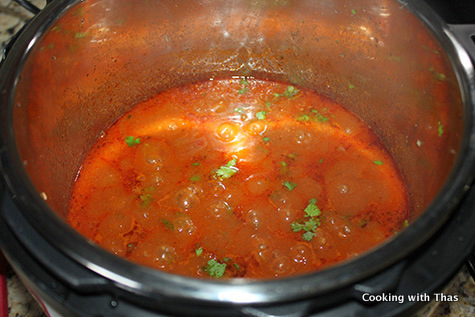 If cooking in a non-stick cooking pan over stove pot: after adding tomato sauce and water, let cook covered for 20 to 25 minutes till ground beef has cooked well, add more water if the gravy dries off.